Don't miss the extremely insightful, news worthy and emotional Dennis Rodman interview (below). -W.E. Retired NBA legend Dennis Rodman broke down in tears during a televised interview saying President Donald Trump was 'proud of him' for his role in helping to enable the historic meeting with North Korean ruler Kim Jong-un in Singapore on Monday. 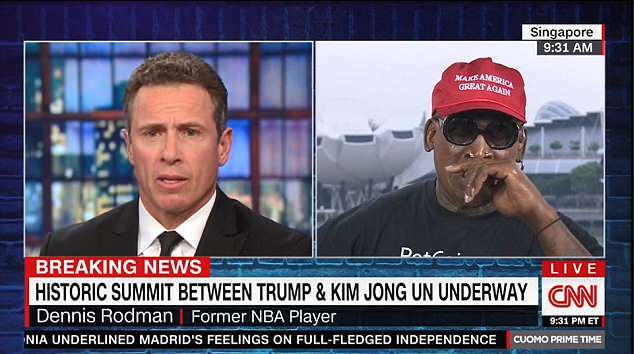 While wearing a red 'Make America Great Again' hat, Rodman became emotional during an interview with CNN. 'In my heart and soul, when I first went to North Korea, I was very honored to be selected to go there,' Rodman told CNN. 'Once I went to North Korea I didn't really understand what the whole situation was as far as being over there. In the bizarre interview, Rodman lashed out at former President Barack Obama. 'It's a great day. I am here to see it. I'm so happy,' the former star power forward said. The former basketball star was referring to his efforts to act as a mediator between Kim and the Obama administration, which rebuffed him. Rodman began crying when he said that he received death threats for meeting Kim in North Korea. 'I had to hide out, I couldn't even go home,' Rodman said. Rodman said people ridiculed him when he met with Kim and predicted that he would be an effective peacemaker. He said that he initially thought he was going to North Korea to play a charity basketball game, but then realized it was 'so much more'. 'I fell in love with the country,' Rodman said. Rodman said he was able to build a relationship with Kim after the Hall of Fame NBA player kept a promise to bring a professional basketball team to Pyongyang in an exhibition game for the country's ruler. He said Kim was 'not a dumb man' and that he wanted to travel the world and visit the United States. 'This guy wants to be around the world,' he said. 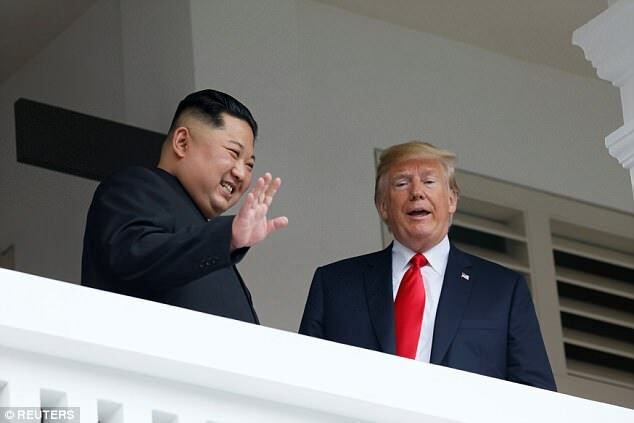 Rodman, who knows both Kim and Trump, said he was hopeful the summit would lead to a new era of peace between the two countries. 'We have really put ourselves on the line to reach out to North Korea and they have been so gracious to me, my family and the United States. So let's make this happen. If Trump can pull this off, more power to him,' Rodman said on CNN. Rodman arrived in Singapore late Monday night, hours before Trump met Kim for the first time. Rodman emerged from the baggage claim area at Changi airport around midnight and told reporters he wasn't sure if he would meet Kim. 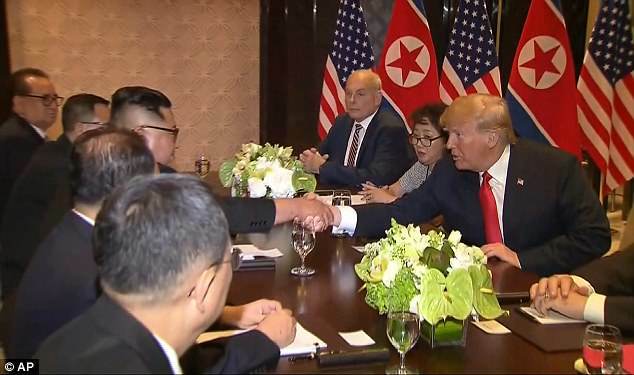 Last week the prolific rebounder, who has traveled to North Korea at least five times, said he would 'give whatever support is needed' to his 'friends' – meaning both Trump and Kim.